It took a few tries before I felt like the flavors and process for this recipe were just right, but my Raspberry Custard Gratin is ready and it’s fruity and creamy, with a tiny bit of toasty. It’s irrisestible… but most important, it’s super easy. 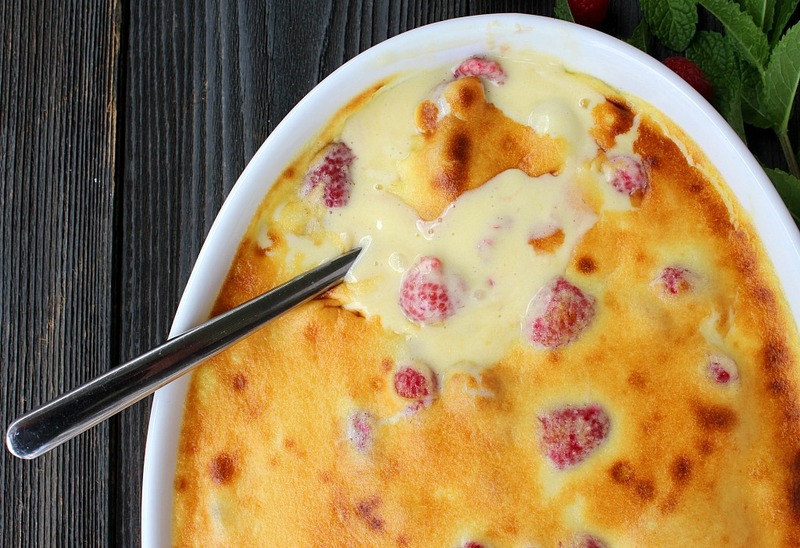 Fresh raspberries get complimented but not overpowdered with the Bavarian custard and whipped cream mixture. The custard is mixed with sweetened whipped cream for the perfect creamy mixture ready to be softened and caramelized under the broiler. I love my 2-quart oval baker! It’s perfect for this recipe and many others. 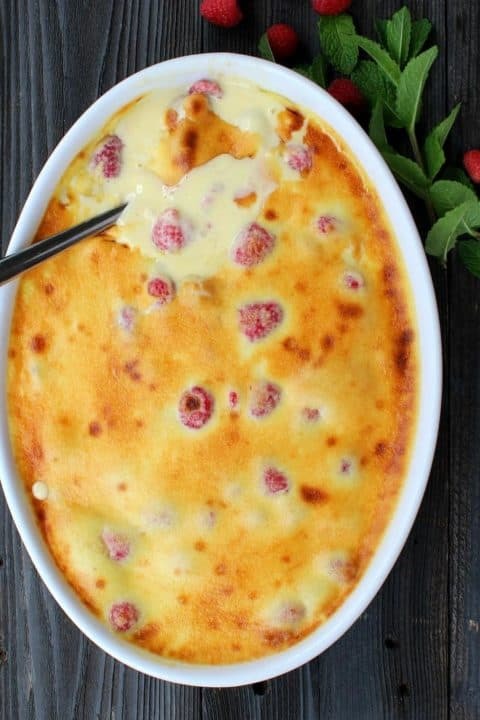 You can make the Raspberry Custard Gratin as well as Scalloped Hasselback Potatoes in it. After the raspberries are covered, they’re ready to go under the broiler for just a few minutes. And during that time, the custard mixture becomes super creamy-soft with the perfect toasted, crispy top. 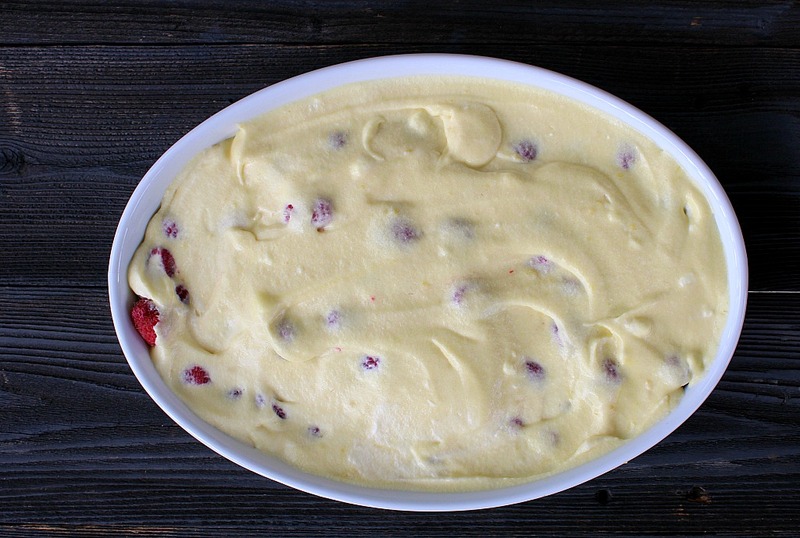 So there you go, simple, fresh flavors of cream and vanilla from the custard mix well with the tart ripe raspberries. And the texture is just right. Here’s a dessert that’s impressive yet easy to get perfect… everytime. The custard, which is the part that takes the most time, can be made up to one day ahead of serving. If the custard is made prior to combining, the dessert only takes about 15 minutes to make. 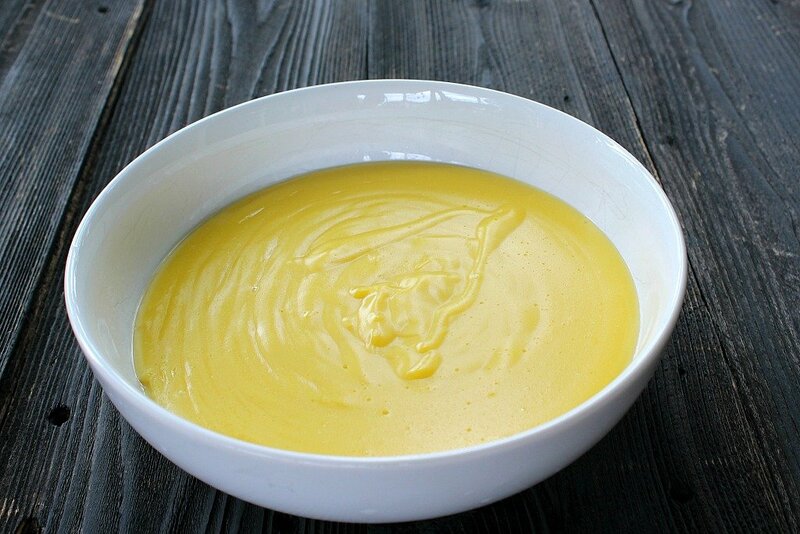 The custard takes about 30 minutes which includes cooling time. Place 4 egg yolks in a medium bowl. Whisk them together and set aside. Mix sugar, flour and salt in a medium saucepan. Stir in warm milk. Cook over medium-high heat, stirring frequently. Mixture will thicken and eventually start to bubble. Cook one minute more while still stirring. Remove from heat. Quickly whisk about half of the mixture into beaten egg yolks. Blend this back into remaining hot mixture in the saucepan. Whisk constantly until mixture starts to bubble again. Cook for another 30 seconds or so but do not stop whisking. Remove from heat and add vanilla. Set aside, cover with plastic wrap and let cool while you make the whipping cream. You can set the custard in the refrigerator to cool quickly. The custard will continue to thicken as it cools. 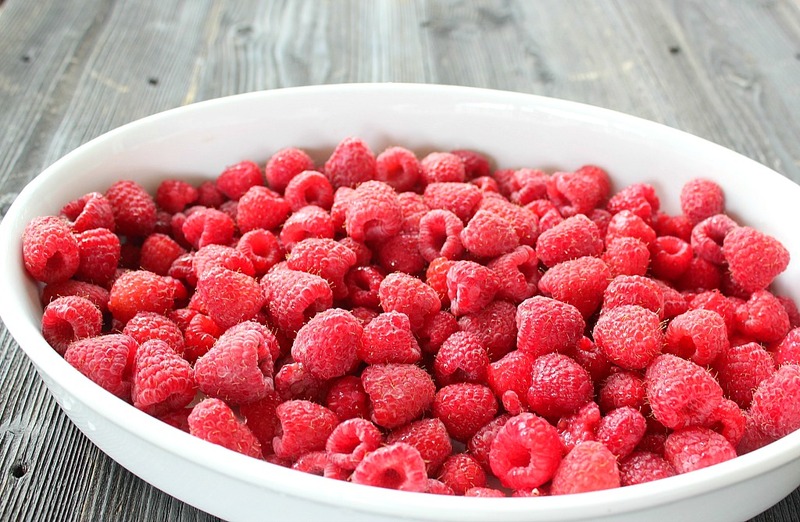 While custard cools slightly, place washed raspberries in a 2-quart oval baker or similar ovenproof dish. Preheat oven to Broil (Hi) and place oven rack at middle position. Place 1 pint heavy whipping cream in bowl of stand mixer or medium mixing bowl. Add granulated sugar and vanilla. Beat whipping cream into stiff peaks, this is important because the whipped cream will soften down when mixed with the custard. 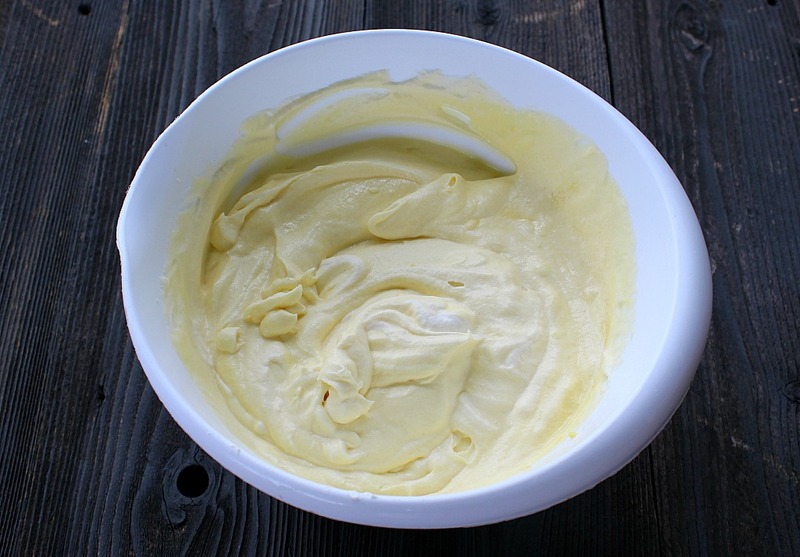 Stir the custard into the whipped cream and combine until the color is solid. 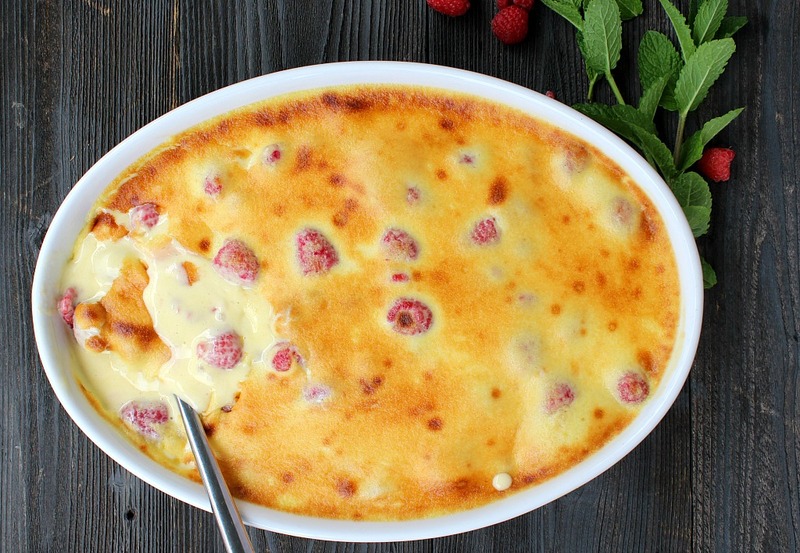 Cover the raspberries with the custard mixture, you might not use all of it. Since the custard will expand when under the broiler, leave about 1-inch headroom between the custard and top of the dish (I usually have about one cup of the mixture that I don't use, but my dish is shallow). Place baking dish on rack under broiler and watch as it browns, about 5 minutes. The custard will start to melt to creamy smoothness and then the top will start to brown. 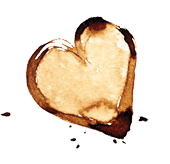 Be careful, once you start to see a few dark spots across the top it will then quickly brown all over. Once the entire top is golden brown, remove from oven. Serve immediately. Cook's note: If you ensure the custard bubbles as directed, it will thicken perfectly and quickly after removing from the heat. Don't be intimidated, it's very easy. As mentioned in the intro, you may make the custard the day before serving. This will cut down prep-time a lot and then you can just whip your cream, layer together and broil quickly. Store leftovers in refrigerator, covered in plastic. Place cold dish in cold oven and then turn oven to 300F degrees. Let dessert slowly heat up for about 20 minutes then switch oven to Broil for another 3-5 minutes if desired. The Sweetness of the creamy custard pairs well with the tart berries and the top is nice and crispy like a creme brûlée. I’ll definitely be making this again ! This looks amazing. And your cream puff recipe is the best.